This is the most common type of lighting sources we use. It is also one of the least efficient. This passes electricity through a metal filament to produce heat. When the temperature reaches 943 degrees F (500 degrees C) the filament begins to give off light as well as heat. The light generated is adequate to see with, but is quite different from the light of the sun. This is because most of the energy that an electric bulb uses is wasted in producing infrared radiation (heat); only about six per cent of the energy input is used to produce light. The resulting light is heavy on red color and its neighbors, but contain very few violet, blue and green. This is very popular in offices and factories. This is more efficient. But the light emitted differs from that generated by the sun. Within the glass tube of a fluorescent lamp, ultra violet rays are generated by a mercury vapor arc. The tube is lined with specially designed luminescent compounds which, when hit by the ultra violet rays, emit light of certain colors. Which colors are emitted depends on the type of compounds used to line the tube. Generally these tubes are designed to give off a high level of yellow-green light, the colors to which the eye is most sensitive. Thus they offer a seemingly very bright light while using relatively little energy. However, like the incandescent bulbs, their light is significantly different from that of the sun. A few lighting manufacturers have built indoor lights that approximates natural daylight in intensity and color spectrum. What they have done is to replicate the spectral balance of daylight. These lights emit a certain amount of ultraviolet as well as all colors in daylight from red to violet. 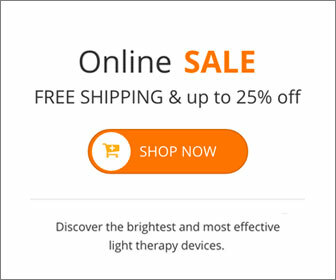 These lights are called full spectrum lights and are very useful for light therapy for SAD. Full spectrum lighting is very similar to the fluorescent tubes. It uses a mercury vapor lamp to emit ultra violet light. The surface of the tube is coated with a compound which will emit the full spectrum light when hit by the ultraviolet light emission from the mercury vapor lamp. The coating is designed to emit all colors of the spectrum in approximately the same percentage as is found in natural sunlight minus the harmful ultraviolet light. Shields are generally provided to prevent the user from getting accidental exposure to the ultraviolet light. Full spectrum light bulbs are made to try to imitate natural sunlight, and like sunlight, they also produce UV rays. Typically full spectrum bulbs have a Color Rendering Index (C.R.I.) of 90 or above (Outdoor light has a CRI of 100) and a Kelvin temperature of 5,000 or above. Full spectrum light is described as having a purple or a bluish cast. Most light box companies using full spectrum light bulbs now block these UV rays through their diffuser screen. Make sure they do before purchasing their products. Broad spectrum light boxes are often described as being as close to full spectrum as you can get without the UV rays. Typically they have a CRI of around 82 and a Kelvin temperature of around 4200. Broad spectrum light bulbs are described as being a pure white light. Most light box companies use a broad spectrum light bulb so that there is no danger of UV rays. One of the major safety concern of exposure to light is the possibility of being exposed to ultraviolet (UV) light. Exposure to ultra violet (UV) light can cause sunburn, eye damage and skin cancer. Recent studies have shown that UV rays are not an essential component of light therapy; units that emit almost no UV light are just as effective. Many of the light box manufacturers provide shields to filter away the UV light. Make sure that the unit you buy complies with this. The¬†North Star 10,000 is a broad spectrum wellness light. With our brightness level of 10,000 lux at two feet, the North Star 10,000¬†is effective, easy and safe to use! This entry was posted on Tuesday, April 27th, 2010 at 4:18 pm	and is filed under Light Therapy. You can follow any responses to this entry through the RSS 2.0 feed.